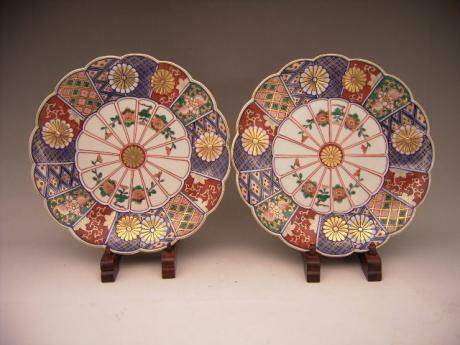 Japanese circa 1900 pair of wonderful IMARI plates. 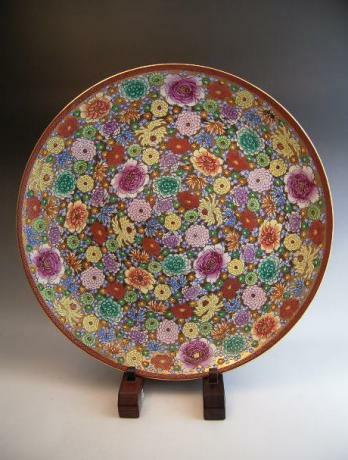 Each plate is in the shape of a chrysanthemum blossom with 16 petals. The plates are done in underglaze blue, overglaze red, green, black, brown and gold. Beautiful design of florals and geometric patterns. 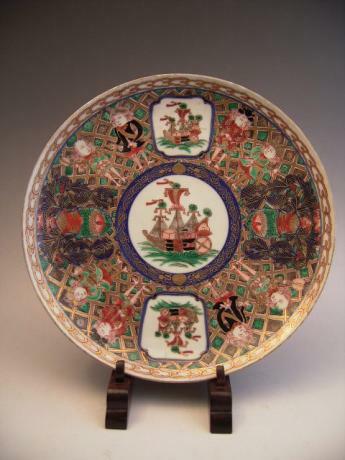 Design and markings in underglaze b..
19th Cenury large Imari charger. 22" diameter by 3" depth. Japanese Meiji Period KUTANI KORO, or incense burner. Signed by maker on bottom. Comes with original TOMOBAKO, signed wooden storage box. 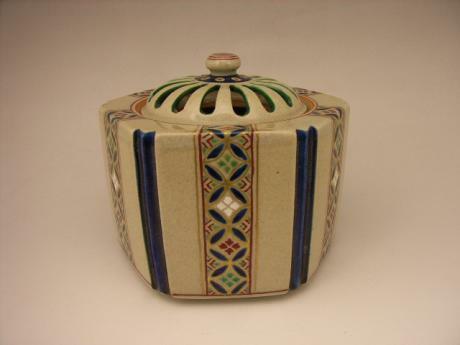 The incense burner measures 3 5/8" tall, 4 3/8" wide and 4" deep. 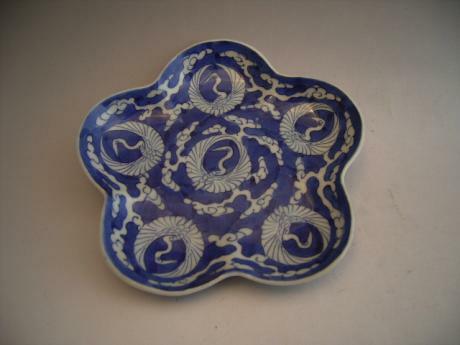 Japanese 19th century blue and white Imari plum blossom shaped plate. The plate has 5 scalloped edges on it. The plate has 6 stylized cranes done in blue and white. The plate measures 6 1/2" wide and 1 1/4" tall. Japanese mid 19th Century SATSUMA incense burner with silver HOYA cover made in the 1930's. SATSUMA incense burner has design of chrysanthemums and HAGI with butterfly. Signed by SATSUMA artist, TOKOUZAN. The silver HOYA cover is made by well known metal artist, OHSUGA TAKASHI. 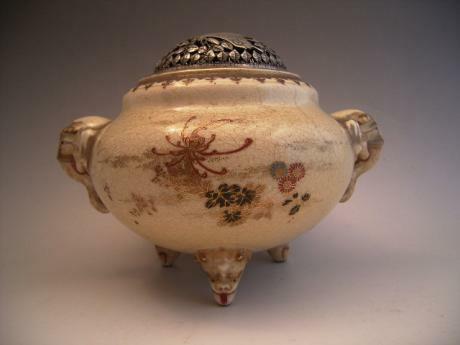 HOYA is signed ..
Japanese Early to Mid 20th Century KUTANI incense burner. 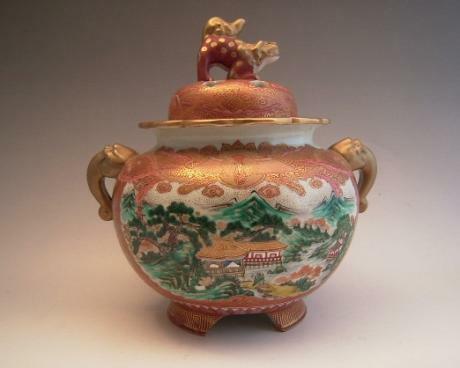 Beautiful incense burner done with red, gold and polychrome enamels in design of Chinese landscape. The lid has four holes and a SHISHI, lion on top. Stylized elephant head handles. The base of the piece has been into tripod legs. 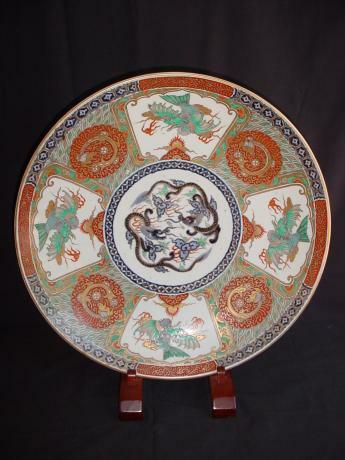 Sign..
Japanese early 20th century large polychrome enamel Kutani charger. A variety of different flowers done in polychrome enamels and gold. Imprinted mark of maker on back. 18" diameter by 3" depth. 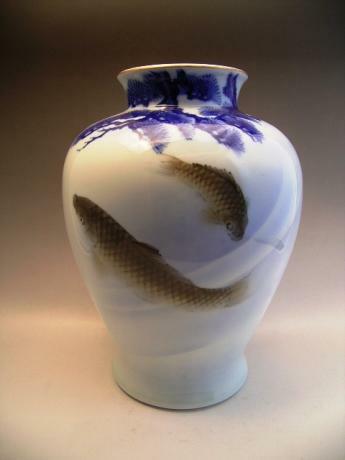 Japanese Late 19th or Early 20th Century porcelain FUKAGAWA vase. Design is of 2 carp swimming below pine tree. Pine tree is done in blue and the carp are done in gray and tan colors. Signed FUKAGAWA SEI in blue on bottom. The vase measures 12 1/4" tall by 8 1/2" wide. 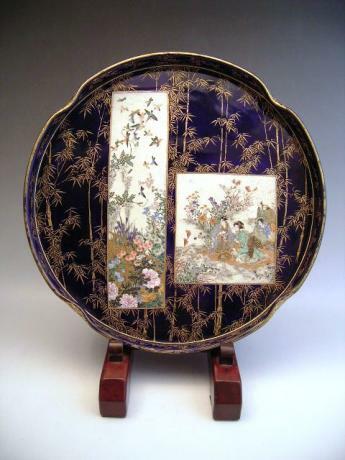 Japanese Meiji Period Satsuma tray. Beautiful circular tray with 2 framed detailed pictures within a cobalt blue background with bamboo painted in gold. Stamp of artist, KINKOZAN on bottom. 11.5" diameter by 1" depth.